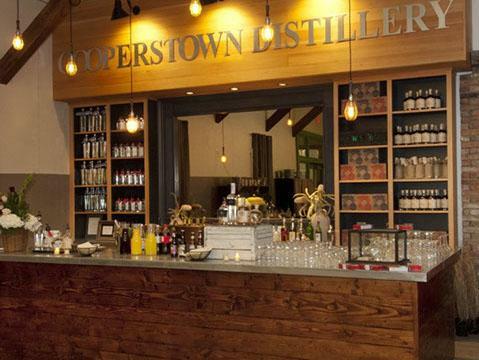 Cooperstown's first and only microdistillery offers award-winning hand-crafted spirits, utilizing a majority of New York State agricultural products in its commitment as a farm distillery. With two locations right in the heart of Cooperstown, the distillery showcases the "field to flask" experience, offering distiller-led tours of their production facility, and tastings of their full line up of spirits at their 11 Railroad Ave. location. "Mash bill of corn, rye, and barley. Drinks remarkably smooth with subtle notes of butterscotch and clove on the palate. Bottled in the custom Abner Doubleday Baseball Decanter. " This trio pack as 1 bottle 750ml each of Beanball Bourbon , Double Play Vodka & Double Play Whiskey!